At Yellow Hill Equine we have developed a range of fixed or mobile round pens which can be made in straight box sections with weld mesh, or box section with solid panels on the bottom and bars / mesh above. As with all our steel work, all the panels are hot dipped galvanize. For varied size rings it is a simple case of adding or removing panels. Our range of fixed or mobile round pens can be in straight box section with weld mesh, or box section with solid panels on the bottom and bars/mesh above. Their flat mesh sections make them easy to expand, reduce, store or move. 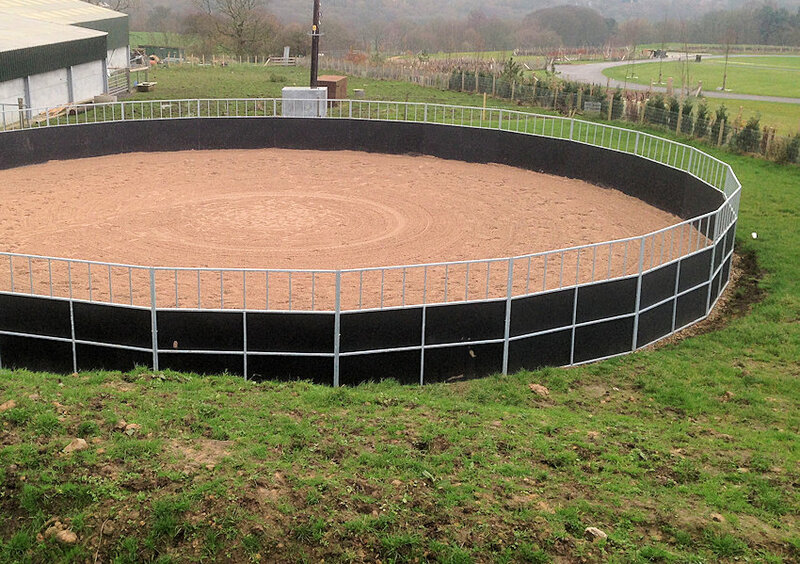 Our round pens are perfect for Stallion / stud work, Restricted Turnout, Breaking and Training or Lunging. They can be made to any required size to suit your needs. A round pen is a valuable addition to any yard or equestrian property, providing a safe environment to exercise and work your horses and an essential area when breaking. Our turnout pens are built to a high standard to provide security and durability. All include drainage, membrane, post and rail fencing, electric fencing if required, kickboards and a choice of surfaces inc : rubber composites, fibre combinations, synthetic textile surfaces and sand surfaces. Whether it be arenas, indoor schools or exercise and turnout areas, we can design your project to fit your property and meet your needs.